This is one of a set of 9 books made for the October 1997 book swop. 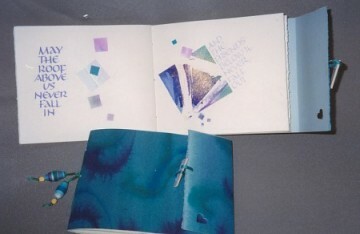 The pages are Saunders Waterford watercolour paper, using a variety of media (watercolour, gouache, ink, pastel, and gold powder) and techniques (washes, cling film, resist, and stencilling). The beads and clasp are hand made.